OK it’s officially hot out now, and in Central Texas, that means very, very hot. And not just for a few months. 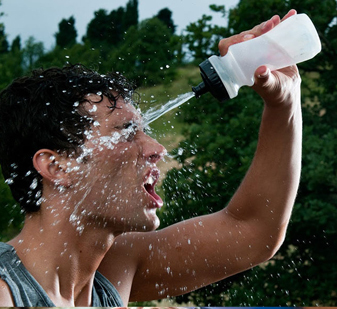 We’re talking for the next six months or so…Yes, we all know that when it’s hot out you need to drink more water when you’re running. End of story, right? Not by a long shot. Many runners, especially younger ones, may feel impervious to heat. The truth is, we all must respect the heat. Even well-acclimated elite runners have no better means of handling the dangers of heat than beginners. A tragic story of a young cross-country runner named Kelly Watt drives the point home. Watt, who lived in a hilly area near Charlottesville, Virginia, was a top runner with a 9:27 best for 3,200-meters. He was also a hard worker, spending his summer working as a sportswriter for the local paper, and was not getting enough sleep. Even well-acclimated elite runners have no better means of handling the dangers of heat than beginners. Planning on running for the College of William and Mary, Watt had been training hard during the summer of 2007, and one hot afternoon, decided to do a hilly eight-miler on one of his favorite courses—a remote ridge run, where he could really push himself. It was his last run. Watt, running alone, took a swig from a Nalgene water bottle before heading out, but did not carry it with him. By the time he made it back to his car, it was too late. Overcome by heat buildup, he was too dizzy to unlock the door and grab his water. He passed out and lay in the dirt until he was found a few hours later by police. Already unconscious, his body never rallied from the severe heatstroke, and he died four days later of multiple organ failure. Watt’s tragic story shows that even young, well-trained runners are not invulnerable to heat. And it doesn’t even have to be that hot. On a humid, 75-degree morning, Austin runner Bernard Manirakiza, who won the Statesman Capitol 10,000 back in 2005, was headed for a repeat win in 2006, when he began to wobble and collapsed on the First Street Bridge. Manirakiza lost the race, but fortunately, was rushed to the medical tent, packed in ice and given IV fluids. Manirakiza always makes sure to drink enough now, but it’s not that simple. The reason he suffered a minor heat stroke that day was because like Watt, he had been pushing himself too hard for the conditions. There’s more to the picture than just drinking enough: many factors come in to play, from ambient sunlight, to humidity, to maximum effort, and believe it or not—sleep. As it turns out, lack of sleep (which was a factor in Watt’s case) inhibits the body’s internal thermostat, making you more vulnerable to heat build-up. In scientific terms, sleep deprivation is associated with reduced thermo-regulatory functions. Don’t push too hard when the heat/humidity index gets up there. Follow those rules, and you’ll have a safe and enjoyable Austin running summer. Upcoming races: Saturday, June 2 at 7:30 a.m., Hill Country Trail Run 5K/10K Dripping Springs Ranch Park, 1042 Event Center Dr. in Dripping Springs. Thursday, June 7, at 8:00 p.m., Maudie’s Moonlight Margarita Run 5K at Seaholm Power Plant, 800 W. Cesar Chavez, Austin.